As a child, Seng Luangrath fled her home country of Laos during the Vietnam War. Her family lived in a Thai refugee camp for two years before moving to California, where they gradually adjusted to American life. As her parents worked long hours cleaning houses and cooking in restaurants, Luangrath became the family cook. 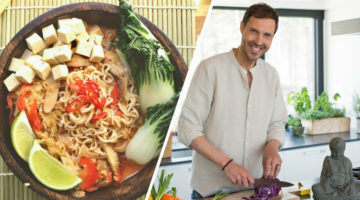 Now, Luangrath is the owner of Washington, D.C.’s only Lao restaurant, Thip Khao, a popular dinner destination for locals, tourists, and foodies searching for powerful umami and eye-wateringly spicy flavors. 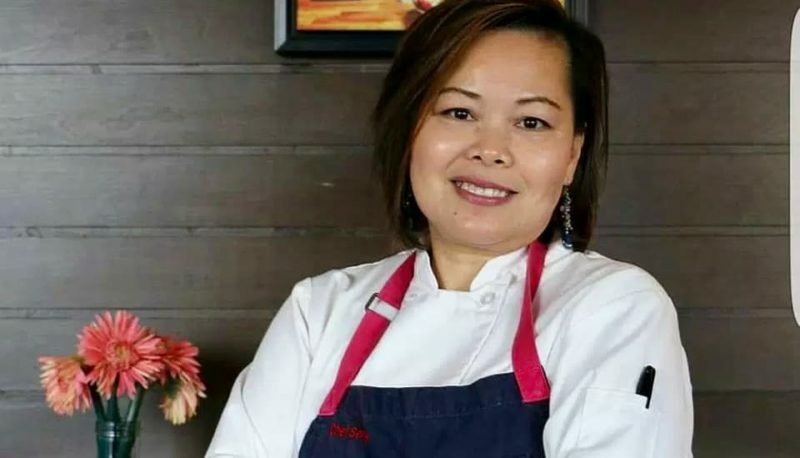 On top of that, Luangrath also owns a Thai and Lao restaurant in Virginia and runs a project to promote Lao cuisine in North America, the Lao Food Movement. A lifelong Buddhist, Luangrath credits her meditation practice with keeping her calm in the midst of a chaotic kitchen, and an even more chaotic life. Haleigh Atwood speaks with Luangrath about her journey from Laos to America, opening her first restaurant, and the Buddhist values woven throughout her life. Haleigh Atwood: Let’s start with Buddhism. Is your family Buddhist? Seng Luangrath: Yes, absolutely. My grandmother is very religious, same as my mother. I remember growing up and going to the temple very often. It’s Lao Buddhism, so the practice is similar to Thai and Cambodian, but quite different from Chinese or Vietnamese. I actually didn’t do a lot of practice until recently. Growing up in America, I was pretty busy and I forgot how. My mom helped me get into meditating and practicing again. How did your mom help you get back into Buddhism? We’ve always been Buddhist, but when we came to the United States we lost our Buddhist culture. My mother got really, really into meditation when she decided to leave my stepfather. She was also having issues with what she had gone through in Laos. When the communists took over, she still continued working for the government. During the war, she had to be ready to work whenever her co-workers or her boss wanted her to. She carried a lot of pain with her. She practices Buddhism because it helps keep her calm. In my kitchen nowadays, I meditate while I cook. When I opened my restaurant eight years ago, I had shared with her about my stress and my anger. The restaurant business is tough, and of course there are very long hours — it’s hectic, it’s crazy. I went through a stressful year after I first opened and I didn’t know how to deal with my anxiety. The only people I could talk to were my husband and my mom. I asked her, “How am I going to deal with this?” Cooking is my passion. It makes me happy, but it’s a lot of stress. Every day she would call me and tell me how to keep myself calm. I do a lot of mindfulness work, like my mom does every day. I take a walk by myself, and I do as much meditating as possible. When I cook, I stop talking. In my kitchen nowadays, I meditate while I cook. People notice it! I use my energy to focus on what I’m doing, kind of like a new state of mind. Do you attend a Buddhist temple or is this an independent practice? Chef Seng’s Lao papaya salad. Photo by JC Gibbs. Let’s go back to the beginning, because you have a pretty incredible story. How old were you when your family fled from Laos to Thailand in 1981? I was 12 years old when we left during the Vietnam War. My mom was the last of her siblings to leave because she needed to take care of my grandmother and great grandmother. My grandmother said, “You better leave us behind.” But they needed someone to rely on, so my grandmother chose my younger sister to stay and help — she was about 10 years old. We left the country with two guys hired to help us escape. We took a bus and met them along the countryside near the border. They put us in huts, waited until 3 am, and then picked us up and took us across the Mekong river. Did your grandmother, great-grandmother, and younger sister ever join you in Thailand? My great-grandmother passed away, but we were reunited with my younger sister and my grandmother in 1988. When you were at the refugee camp, where did you live? We were in three refugee camps. They all had rows of fenced bamboo huts that we shared with other families. The first hut was divided between four or five different families, and each one of us only had pretty much a place where we could sleep. Do you remember what kind of meals you ate? Because I was the oldest daughter, I helped my stepdad and my mom with the cooking. My grandmother told me that we treat our rice like it’s sacred. I remember that a lot of food distributed to us was usually the same kind of meat. We would go and pick up Thai steamed mackerel, Chinese sausage, and maybe some rice or some fish sauce here and there. We got tired of eating that every day, so we would trade with the local people for produce, dried beef, and some herbs that we couldn’t get inside the refugee camp. Do you have any memories of making food with your family from when you were still in Laos? Yes, definitely. My grandmother would get up early to cook sticky rice for her twelve children. She taught me to soak the sticky rice at night before everyone went to bed, and then she steamed it. She told me that we treat our rice like it’s sacred. It’s very meaningful for us, because my grandfather had to work so hard at a rice paddy to grow the sticky rice for us. I read that you also learned about cooking from your neighbors in the refugee camps. Yeah! Like in any country, cooking styles are different based on local resources. I didn’t know that until I got to the refugee camp and discovered there are so many different styles and techniques. I started observing what my neighbors were cooking, so that’s when I started exploring. When your family moved to the US, did you still do the cooking while your mother and stepfather were working? The income that my parents made wasn’t enough, so my stepdad had to get a second job and my mother had to work more. My mom didn’t have much time to cook, so she assigned me to take care of the laundry on the weekends, take care of my siblings, and be the main cook of the house. I read that you would watch cooking shows when you had free time. Yes! On my weekends and holidays, I would tune in to Julia Child, Jacques Pépin, and Martin Yan. In Laos we didn’t use a wok and we didn’t have an oven. We used open-fire cooking for stewing and grilling. I loved Julia Child! I remember she braised a whole chicken and stuck it in the oven. I was like, “Oh my god, we have an oven at home!” We never used it because we didn’t know how to use it, our oven was like our storage. Thank goodness for Julia Child! Later in life, when you married your husband, he started a flooring business that you helped him with. I was helping him with paperwork and I overseeing the shops. I didn’t like it, I hated it. On my first day at the shop I cried, but I had to do it because we had already put our money into it. Eventually, we started doing minor construction, and my husband noticed I wasn’t happy. He told me, “Why don’t you decide what you want to do? Just stay home, I can handle this.” I did that for two years. I was a housewife, and I was also catering from my home. I went to the super market two or three times a week, going through every single aisle to research all the different ingredients and reading all the labels. Chef Seng’s dedicated Lao restaurant, Thip Khao. Photo by JC Gibbs. Can you tell me about starting your restaurant? My goddaughter was working for a Thai restaurant called Bangkok Golden, and she called me when she heard that the owner was going to put a second location on the market. The owner was interested in me because she had heard about my cooking, so I drove to see her immediately. I told her I didn’t have experience with any restaurant, but I just needed one month to adjust. She said, “Okay, come every day and spend time in the kitchen.” I spent a whole month learning from her staff, and a month later she handed me the keys. Thank goodness I had previous business experience. I was nervous, but I told myself that I trust myself, I trust my food, and I trust my cooking. Do you remember when you first added Lao recipes to the menu? Many Lao people feel a little ashamed because the countries surrounding us looked down on us, because we were poor. I thought, “How am I going to come out of that shadow?” I asked my husband, “Why am I not serving Lao food?” My husband said if I thought people would eat it, then I should go ahead and do it. I wanted to prove to people that Lao food is good. The first Lao food I served on the menu came two or three months after I opened the restaurant. I told my staff that the special of the day was laab chicken and papaya salad. Most guests had no idea where Laos is, so I would have to come out of the kitchen to explain. Eventually people would come in and say, “Someone told me about Lao food. I want to try it.” It became word of mouth. One of the first reviews that came out was from Tom Sietsema from the Washington Post, and it was really, really positive. How did that make you feel? Oh my gosh, I will never forget that moment. My sister-in-law ran into the kitchen and she was like, “Two white guys came in and said they want you to make the food that you would eat.” I made papaya salad and laab chicken, and they ordered more stuff from the menu. I didn’t think any non-Lao person would eat the papaya salad. There’s Thai shrimp paste, crab paste, and unfiltered fish sauce in my salad — it’s very strong. I was nervous about what kind of review was going to come out, but it was a good review. I emailed him immediately at 3 am to say thank you so much for putting Lao food out there. It was a big deal for me. Now we have two menus, the Lao menu and the Thai menu. Since then, how has your restaurant changed? It immediately got people’s attention. A lot of food bloggers and writers came in, and it became a destination for diners. But customers were confused about the name, Bangkok Golden, because it only identified Thai culture. My husband and I were too busy—we didn’t have the time and we didn’t have the money—so we kept the name for a very long time until it changed last year to Padaek, which is Lao fish sauce. 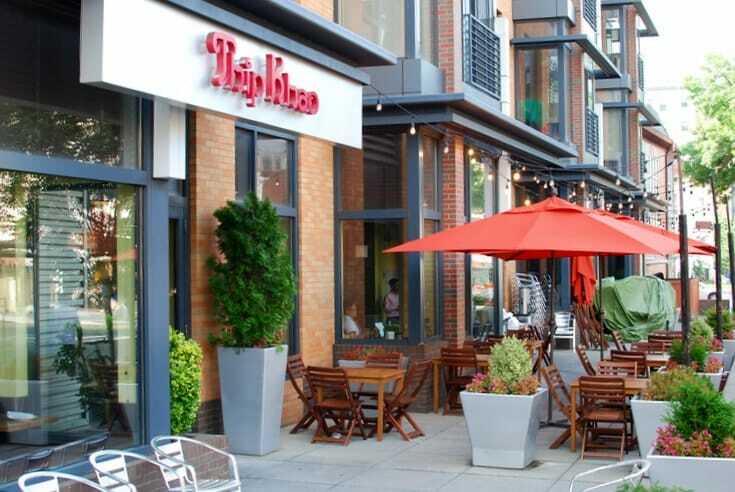 You also have a second restaurant located in D.C. called Thip Khao. When did that open? We opened Thip Khao in 2014. I was getting a lot of support from D.C. diners and I wanted to open a Lao-only restaurant. I decided to be proud of who I am, my identity, and my culture. Can you tell me about the Lao Food Movement you started? There are all kinds of different movements, so I thought why don’t we start a movement to teach people about Lao food? About two years ago, I started a mentorship and consulting program for other chefs and restaurant owners who want to know more about Lao food. A lot of Thai restaurants are owned by Lao people, but we don’t need to hide behind other cultures. We need to be proud of ourselves. Have you gone back to visit Laos to see how the cuisine has changed? Yeah! Part of the reason I traveled to Laos two years ago was because someone wanted my consultation. I was excited to explore Lao cuisine because I left many years ago. The cuisine has modernized. People are still cooking with open fires, but I saw more people use stoves and ovens. I saw a lot of creativity: different people, different restaurants, different chefs, there was even street food I had never seen before. 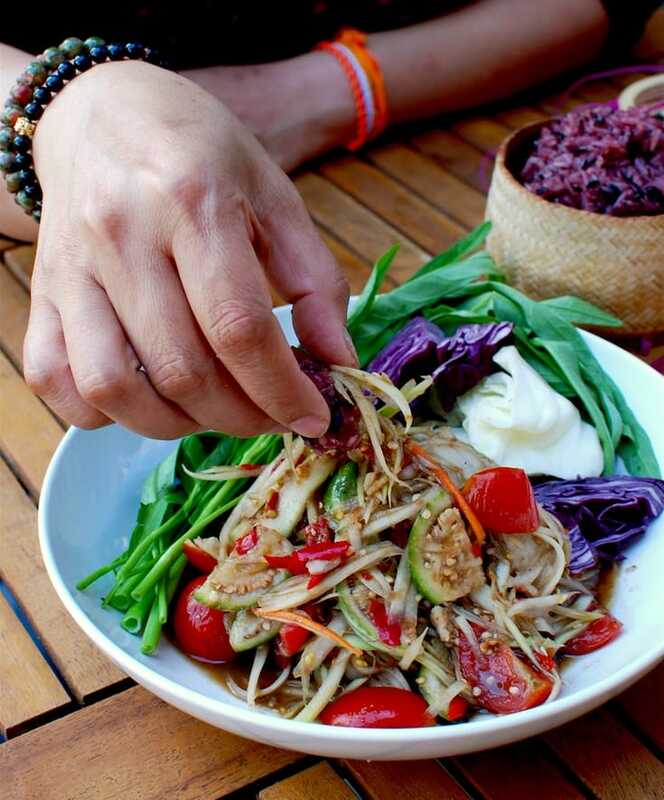 Do you have any future plans for the Lao Food Movement or your restaurants? I want to see more Lao restaurants, which is already happening. I want to spend more time consulting and more time talking about Lao food. My goal is to stick in D.C. where I’m in control of my cuisine. I want to stay true to my cooking. How has Buddhism influenced your career as a chef? It’s impacted my career a lot. Without Buddhism, I probably wouldn’t have gotten to where I am today. Mindfulness meditation and walking has helped me a lot. My mom always told me you have to treat your staff with compassion and respect. They are part of your growth, they are part of your success. She also told me to never forget where I come from. I’m thankful to my mom for bringing Buddhist practice back into my life. Buddhism is one of the reasons I spend a lot of time alone. I’m alone as much as possible on my days off — some place where I can relax, where I can meditate.